"I Started a Skate Rink Business in Family-Friendly Boquete"
In Boquete, you are always surrounded by vibrant displays of nature. When Leslie King’s parents decided it was time to retire, they had a family meeting about where they would live. Her dad was the first to come up with the idea of moving to Panama. After that, Leslie researched like crazy and came to the same conclusion. “It had the perfect temperature,” she says. “The same each day. No need for heat or air conditioning.” As the whole family suffered from allergies and sinus issues, they felt that without the artificial temperature control they might all be healthier; which proved to be true. 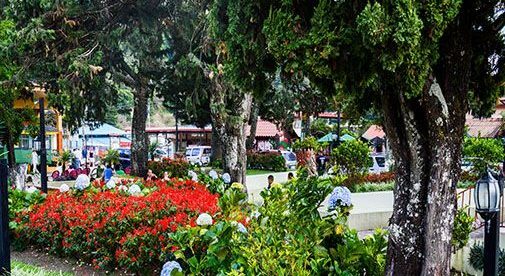 Moving to the small mountain town of Boquete, in Chiriquí Province, made sense for the family, as it offers plenty for every generation. There is an older expat community here, offering events and activities to appeal to Leslie’s parents as well a myriad of eco adventures for her young son, Kane: zip lining, hiking, rafting, kayaking. Healthcare was considered as well, and Panama is known for having excellent and affordable doctors, many of whom were trained in the U.S. While her parents settled into their retirement and their new home, Leslie and Kane took three months out to explore Panama by ATV. A bonus with Boquete is its proximity to so many attractions. It’s a 45-minute drive to the stunning beaches of Las Olas and Las Lajas; and a one-hour drive to Volcán, where the rolling hills peppered with herds of cattle are awe inspiring. Visit Raquel’s Ark to spend an afternoon cuddling a rescued sloth. Kane made friends through social media and started school. Leslie frequently took him and his friends to the beach and was always on the lookout for more things they could do. That’s when she had the idea for a skating rink business (skating was one of Kane’s favorite pastimes in Arizona). After all, she still needed a way to support their new life. So began the search for suitable premises. A big space was needed, but that would come with big rent. The alternative was to build it herself, so she got to work. Within six months Leslie had found a suitable lot. After one year, she had bought the lot, found an architect, started building, and Skateworld became a reality. Then came the details: business permits, work permits, health cards for the workers, etc. Leslie had all that completed in one-and-a-half months. Leslie ordered affordable skates from China. She also bought a stereo and kitchen equipment—as food would be offered. Finally, all was in order and Leslie anguished over the impending opening. Would the community actually embrace the idea? They did. Over 1,000 people came to the opening and Skateworld was an immediate success. With low start-up costs, Leslie was able to charge only $2 per hour, making it affordable for everyone. Advertising brought in busloads of skaters, filling the rink with 200 to 300 people at a clip. As a way to give back to the community, Leslie entertains the local orphanage at Easter, Christmas, and the first week of June. On Wednesday nights there is a youth group for teenagers. Christmas Caroling and a Halloween Hallelujah round out a very full season in a venue that offers fun and safety for the youth of Chiriquí.